Is your vacuum not getting the job done like it used to? Don't give up on it before bringing it in to our shop for expert repairs. Our technicians have over 35 years of experience in vacuum repair. When it comes to problems with vacuum cleaners of all makes and models, we have seen it all. Bring your vacuum in today and let our skilled professionals fix it for you. We offer affordable repairs like tune ups, complete services, belt installations, and great service that we have provided for over 50 years. 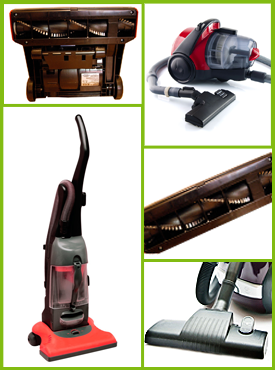 Our inventory includes most major replacement parts and accessories for every vacuum out there. When your vacuum is still under warranty and you experience problems, bring it in. We are your local warranty repair shop offering expert service and geniune factory parts. When you take advantage of our expert repairs, you can rest easy knowing we back up our service with a comprehensive warranty. Get your FREE estimate for quality repairs. We also provide FREE belt installations.